Are you a Reader? (Note the capital R for Really - truly - reader - who - loves - books.) Do you recognize this feeling? You finish a book, close the covers, sigh, and stare into space. Probably your face wears a slightly goofy smile. You've grinned, you've worried, you've laughed, and you've forgotten your current reality while your eyes have been fixed to the pages of the book you now plan to read again immediately. Wishbone is that sort of book. Written by Janeen Brian, illustrated by Kilmeny Niland and published by ABC Books (Australia) in 2002, it is a simply delightful picture book about Henry, who wants a dog. Brian knows dogs, and her background as a poet shines through in the deft word pictures which are beautifully complemented by Niland's pictures. He wanted a little rough-and-tumble dog with feathery ears and eyes as black as licorice ... Or a roly-poly dog that loved to have its tummy tickled. Kids will certainly relate to Henry, and dream doggy dreams with him. Parents will enjoy a beautifully crafted read-aloud which will leave reader and listener alike totally satisfied. Silly Galah, Where does Thursday go?, Too Tight Benito, Columbia Sneezes, Elephant Mountain, Oddball, By Jingo! an alphabet of animals here at the Book Chook. I also reviewed Kilmeny Niland's Two Tough Teddies. How very sad I am to realize that she passed away earlier this year. Take a look at her literary and artistic legacy, particularly these wonderful haiga. 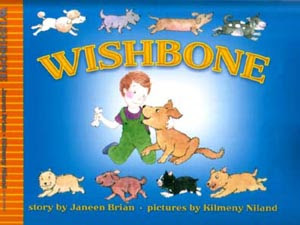 Wishbone would make an ideal starting point for youngsters studying pets. Older kids might like to look at wishing in general, or in particular cultures. Why do people "wish upon a star", make a wish when they blow out birthday candles, break wishbones, or throw money into wishing wells? Know what I wish? I wish Janeen Brian would continue writing books that make me wear a goofy smile!